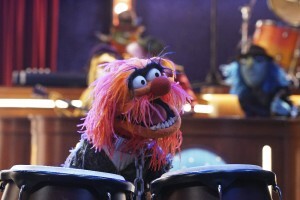 It's time to play the music, it's time to light the lights: The Muppets has been given an extended episode order by ABC. The network is greenlighting three more episodes of the show, bringing its freshman total to 16. While reviews have been mixed, the show is the highest-rated new Tuesday series among adults 18-49 (2.6 rating) and according to ABC, has improved its half-hour for the network by 69% in total viewers (7.6 million vs. 4.5 million) and by 86% in Adults 18-49 (2.6/10 vs. 1.4/5) compared to last season. The pickup comes after this Tuesday's episode of The Muppets saw increases in the adults 18-49 demo, even against the World Series. RELATED: Should The Muppets get a second look? The Muppets features Kermit and the gang as they produce late-night talk show “Up Late with Miss Piggy.” Bill Prady and Bob Kushell are co-creators and executive producers. Randall Einhorn, Bill Barretta, Debbie McClellan and Kyle Laughlin are also executive producers. ABC Studios and The Muppets Studio are behind the show. PLUS: Why these four new shows also got full-season orders—but this one got canceled.